Unfortunately, like most powerful and complex programs, SoftStep has a steep learning curve and is somewhat difficult to use. 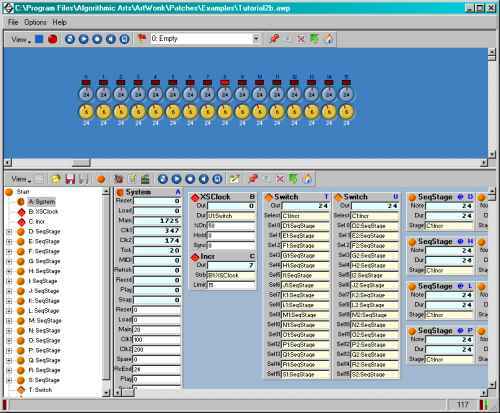 It is possible to use SoftStep to make complex sequencers that one can play interactively, however the more sophisticated the design the more difficult it becomes to play. This is because the programming interface (modules, interconnections, and data) and the performance interface (knobs, sliders, lights, and buttons) are on the same screen. To be fair, there are many SoftStep users that like the single-screen interface; but not I.
I have designed a good deal of hardware electronic musical instruments, including a step sequencer, see here. What I'd like to be able to do with a software sequencer is to build a virtual version of something I'd make in hardware, and I'd like to be able to operate any of the controls from an external MIDI controller. With SoftStep, I could get the functionality, but not the playability. .
ArtWonk has several design breakthroughs that directly address these shortcomings. In the new program Algorithmic Arts has split the programming and the interactive worksurfaces, and they have significantly improved both. To design a device in ArtWonk one interactively picks modules from a rich pallet. There are a vast number to choose from including modules for MIDI I/O, Logic, Clocks, Patterns, Processing, Sequencers, Arrays, Widgets, Graphics and more. There are even function modules where you can write code in a relatively rich programming language based on calculator script. When a module is picked, it appears on the programming screen (called the workspace), and if there are interactive controls or indicators associated with it, like for the knob module, these appear on the performance screen (called the panel) as well. On the programming screen, a module looks like a text table, with its inputs and outputs listed. If the modules have "hidden" details, you can click on a little icon and they expand to allow you to edit whatever is appropriate. You can easily move the modules and widgets on either screen with the mouse as desired. Because controls and displays (called widgets) only appear on the panel, you can design a virtual device exactly as you would design a piece of hardware. The panel has a very good editor. You can resize, relocate, change colors, change fonts, and annotate the panel quite adequately. There is a very rich set of widgets with which to build your user interface. Every widget can also be controlled by a MIDI input. When you choose to do this, even the knobs turn when the MIDI input changes. Very slick. Very useful. The program is developed on the workspace screen, and when you are finished with it, it is minimized, "behind the curtain". When you are making music, all you work with is the control panel; the "circuitry" is invisible - as it should be. The programming workspace has many improvements over SoftStep, the most significant perhaps is that ArtWonk is hierarchical. Thus, you can design your own modules that work exactly like the built ins modules. Modules built from other modules are called macros. When using the worksurface, you can instantly expand any macro, make edits and return to the higher level. If you make an edit, you can apply it to all places that macro is used, or just to the one instance. This is very nice, it solves lots of headaches in program development. On the left side of the worksurface is a hierarchical listing of all the modules and macros in your design. it looks like a folder listing in Windows or on an Apple. At first I thought this was a waste of screen real estate, but it turns out that in hierarchical code development, this is very useful, almost indispensable once you get used to it. Interconnecting the modules is a drag and drop operation. Making edits is as easy as you'd want it to be. You can't connect signals that are incompatible. 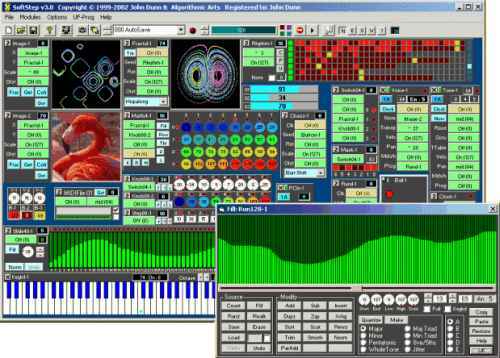 I've seen lots of graphical programming environments, such as MAX and KYMA. This program has no peer in this area of graphical interactive program development. 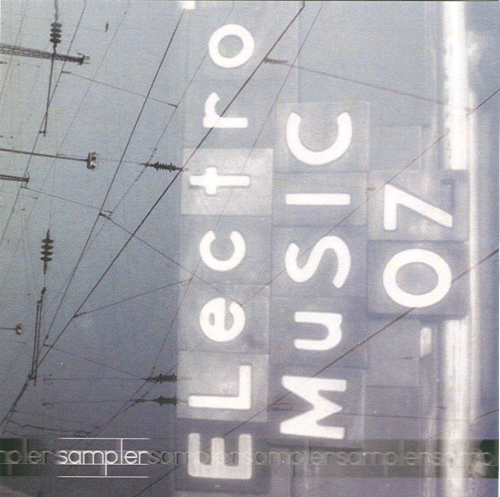 ArtWonk has facilities for generating graphical images as well as MIDI. I can't comment on this because I'm not interested in this feature. I notice that it runs with very high screen resolutions. 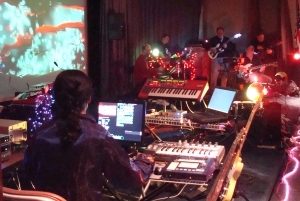 It might be fun to create moving images to project during live performances. The complete user's manual is online at the Algorithmic Arts web site. I think it is quite good. There are several tutorials to get you up and running. Support for Algorithmic Arts products is outstanding. They've set up an new online support forum, which is quite good. There is a user community where people share ideas and complete patches. In summary, if you are interested in algorithmic composition, real-time MIDI processing, step sequencing, and related activities, then you owe it to yourself to try out ArtWonk. John Dunn, the principal software developer at Algoritmic Arts, has been working on these programs for many years. Every few years he comes out with an improvement. ArtWonk proves the power of perseverance. This time he's got a real winner; it's finally come together. Congratulations.